You always see dogs dragging their owners down the street or in the parks. As a dog parent, who wouldn’t love to train their dog to walk on a loose leash? Dog loose lead walking is a challenging task. There is this good old strategy of standing still like a tree when your dog is on the leash and tries to drag you down. However, this strategy is most efficient with puppies and not the older or adolescent dogs. When you wish to train your dog to walk on a loose leash, you need to consider different factors ranging from the leash type to how to reward your dog. Training your dog to walk on a loose lead requires the right accessories. A double-ended waist walker is an appropriate tool when it comes to walking multiple dogs without losing the upper hand. This dog walking tool allows you to clip one end of the leash around your waist while the other end is clipped to the dog’s collar. This tool provides you with greater control since your hands are free. Hence, it is considered to be a good start when you decide to train your dog to walk on a loose leash. Front clip harness: is a type of harness which is used to train strong dogs to walk on a loose lead. The harness covers the dog’s chest and is designed in such a manner that it curves in the opposite direction to which the dog pulls. This will restrain the dog from trying to drag you down in the forward direction. Treat pouch: training your dog to do something can be more effective if you combine it with treats. This is where a treat pouch can be handy. Once you clip your dog to the leash and if he tries to pull you towards the gate, try and calm him down. Order him to sit and reward him with treats once he obliges. When your dog is calm you need to try and walk him to the gate again while making sure that he is not dragging you down. It is ideal not to walk your dog to his favorite park or the normal spot. Instead, take him to a new destination and ensure that the lead remains loose. When your dog starts pulling, stop on your track and let your dog know that something is wrong. Repeat this and once your dog stops and seems like getting the idea, give him a treat. 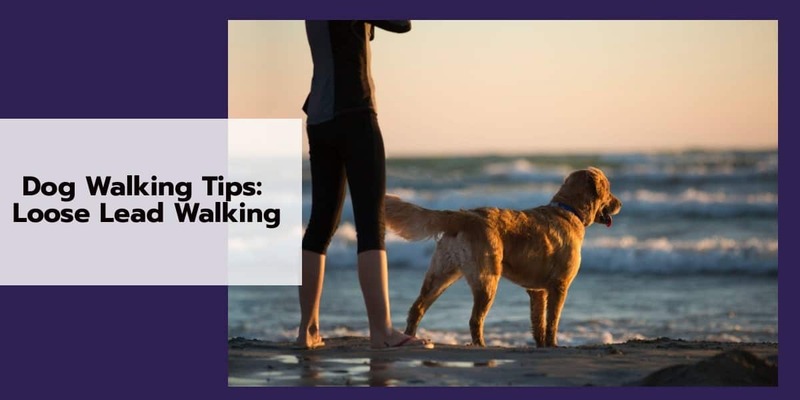 Take small steps and also give your dog a break to sniff around or to do his business. You can use a verbal cue to indicate to him that you are giving him a break. This will instill the trust in your dog that you will reward him with the required time if he is patient with you. If you wish to lure your dog back to you, use another verbal cue to bring him to your side. You can start by using the verbal cue and pointing to your side. Initially, reward the dog when he comes to your side when using the verbal cue. Carry out the process with patience and mix it with lots of appreciation and treats to let your dog know what is expected of him.